Today we will be hearing about athletes who are twins and we will be learning the words: talent, combination and pedigree. So does sporting talent run in the family? So do people in the same family often have the same sporting talent? Well identical twins Jonathan and Kevin Borlee seem to have a similar talent. 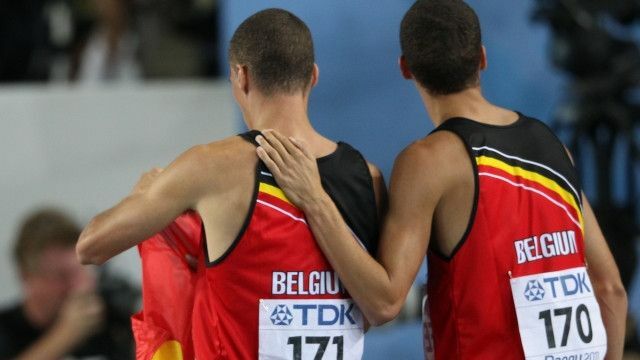 They're two of Belgium’s top athletes and both compete in the 400 metres. Let's hear previous Olympic medal winner Michael Johnson talk about Jonathan and Kevin Borlee. What does he think of the Borlee twins? Listen out for the words combination and pedigree. I think they are talented. I think it’s really a combination of their talent, you know, there’s obviously pedigree there with their Dad being a coach and having been an athlete himself. Let's listen again for the words combination and pedigree. Well Michael thinks the Borlee brothers are talented! Michael said he thinks their success is a combination of their talent and their pedigree. It’s really a combination of their talent and their pedigree. Here is an example sentence: the twins have a very good pedigree. Well so far we have learnt the words: talent, combination and pedigree. Now let's look at the noun talent and the adjective talented a bit more. Let's listen to people in London using these words. I have a talent for playing tennis. One of my talents is writing. My sister is a very talented painter. Now complete the sentences with the adjective or the noun. 1. He was leading the race and then he fell over in the last _____________! 2. Usain Bolt made _____________ in the 2011 World Championships and he was disqualified. 3. In next year's Olympics there will be a lot of competition in the 100m _____________. 4. Russia won the women's 4 x 100m _____________ in the Beijing Olympics. "…there's obviously pedigree there with their Dad being a coach and having been an athlete himself." We use a reflexive pronoun when the subject and object are the same. You can use reflexive pronouns to emphasise the subject or object. e.g. A: Who made this cake? B: I made the cake myself! Now complete the sentences with the correct pronoun or verb from below. 1. Claire introduced ____________ to the other pupils in the class. 2. A: Did you take your car to the mechanic? B: No, I repaired it ____________. 3. I haven't seen you both in ages! Please come in and make ____________ at home. 1. He was leading the race and then he fell over in the last lap! 2. Usain Bolt made a false start in the 2011 World Championships and he was disqualified. 3. In next year's Olympics there will be a lot of competition in the 100m sprint. 4. Russia won the women's 4 x 100m relay race in the Beijing Olympics. 1. Claire introduced herself to the other pupils in the class. B: No, I repaired it myself. 3. I haven't seen you both in ages! Please come in and make yourselves at home.